Russian conductor and artistic director Valery Gergiev has emerged as a charismatic cultural ambassador. His vision for the Mariinsky Theater overshadows the Bolshoi today, but his best performances are not at home. Russian conductor Valery Gergiev and the Mariinsky Theater have come a long way since his first tour of the United States in 1992. For the past two decades, the Russian conducter has been aggressively exporting Russian music and musicians to the West. Gergiev and his Mariinsky Theater Orchestra recently completed a three week tour of North America, performing 18 concerts in 11 venues across the continent. With a new DVD of the 4th, 5th and 6th Symphonies of Tchaikovsky out, the famed musicians spent most of the tour playing Tchaikovsky, including five concerts at Carnegie Hall in New York. Their tour coincided with the 120th anniversary of the prestigious venue – in 1891, Pyotr Tchaikovsky conducted on the opening night of the concert hall. On all five days at Carnegie Hall, Gergiev and his troupe delivered extremely high quality performances. But it is often noted that the programs were of a quality that audiences in Russia, unfortunately, do not always get. Much has been said about Gergiev and the Mariinsky’s hectic schedule. If they occasionally delivered performances not worthy of one of Russia’s best musicians, it is usually blamed on lack of rehearsals and overwork. “Sometimes people ask, what is the Russian soul? There is no answer. But if you listen to Tchaikovsky’s symphonies, you can come closer to the answer,” Gergiev told students at Columbia University where he participated in the World Leaders Forum. Perhaps that is why Gergiev comes back to Tchaikovsky time and time again, ever since he started out at the Mariinsky. Both Gergiev and the theater have come a long way. Since that time, the company and its driving force, Gergiev, have grown ascendant. Gergiev emerged in the early 90s after the fall of the Soviet Union; a charismatic and energetic leader emerged from the chaos. State support for the arts dwindled and theaters floundered, losing some of their best talent. Moscow’s Bolshoi Theater had been protected under the Soviet regime; the country’s best talents were always ushered towards Moscow. However, the Bolshoi and its chief conductor and artistic director Alexander Lazarev were powerless to stop the exodus of artists once the regime fell. Drained of both cash and talent, the once famed Bolshoi took a backseat to the Mariinsky Theater under Gergiev’s direction. Gergiev wanted to turn the theater into an internationally renowned brand, and he started off by tentatively releasing a few recordings with Philips – Prokofiev’s Romeo and Juliet in 1991 and an opera, Mussorgsky’s Khovanshchina the next year. Several more opera recordings followed – all of them unfamiliar repertoire in the west. It was as much a renaissance of forgotten Russian operas as a renaissance of the Mariinsky Theater itself. Rimsky-Korsakov’s jewels of operas such as Sadko and the Maid of Pskov showcased the traditional side of the genre, while Gergiev pushed the envelope with daring productions and recordings of obscure Prokofiev operas such as The Fiery Angel and The Gambler. The company’s tours abroad were met with rave reviews. Valery Gergiev and the Mariinsky Theater were the new Diaghilev and Ballet Russe. He recruited and promoted vocal talent aggressively. Aspiring singers headed to St.Petersburg rather than to Moscow, which was losing its position as Russia’s cultural capital. Some of the biggest names in the business today came out of the Mariinsky Theater led by Gergiev–Olga Borodina, while still a student at the St.Petersburg Conservatoire across the street, was recruited to sing Khovanschina’s leading female role Marta and Anna Netrebko also got her start there. “It was sink or swim,” said one singer of Gergiev’s approach. It may have been ruthless, but he got results. The Bolshoi made tentative efforts to follow the Mariinsky’s path, but met with little success. A disastrous production of The Gambler forced newly appointed music director Gennady Rozhdestvensky to resign the day after its premier in 2001. Since the Mariinsky began employing fashionable young directors such as Dmitry Chernyakov and Dmitry Barkhatov in the early 2000s, the Bolshoi followed suit, but with mixed results. In 2006, former diva Galina Vishnevskaya swore she would never set foot in the Bolshoi again after seeing Chernyakov’s unconventional take on Eugene Onegin, and this season, his daring staging of the quintessentially Russian fairytale Ruslan and Lyudmilla at the opening of the restored theater provoked the audience into shouts of “shame!” and “out of the Bolshoi” from the audience, music critic George Loomis wrote in Musical America. However both theaters now face the same challenge – the restored Bolshoi has added 1750 seats to Moscow, and Mariinsky Theater’s second stage, under construction since 2003, is expected to add a similar number to St.Petersburg when it is completed. Both theaters will find their work cut out for them to fill these new spaces with vocal talent and productions good enough to sell all these tickets. However, that is easier said than done. “Both the Mariinsky and Bolshoi operate on the theory that they are repertoire theaters, and that’s pretty hard to do nowadays,” Loomis pointed out. Most opera companies in the world now operate without a roster of artists who work mainly for a specific company, and instead collect guest artists for each production. “The Bolshoi is doing Rosenklavier soon, and I don’t think that’s an opera they have singers for at the Bolshoi.” He also added that since the Bolshoi had been working only on the smaller so-called New Stage for the past few years, they simply don’t have enough productions to put on the restored main theater’s stage. Where the newly resplendent Bolshoi intends to go from here is still unclear. So far, music director Vassily Sinaisky has not made any notable changes to the theater’s artistic direction. The theater’s schedule for the next three months indicate that for now they are rotating the few productions that they have. Gergiev’s mission has not changed much since he came to the helm of the Mariinsky. Promoting the Mariinsky brand–comprised of his theater, orchestra and numerous singers that he discovered himself – abroad is still a priority, as is expanding and developing operations back home, where he is seen as a musical savior. When Moscow’s GASO (State Academy Symphony Orchestra) was finally relieved of its unpopular artistic director Mark Gorenstein, the orchestra members piped up that they want Valery Gergiev to become their new leader. Although that did not come to pass, rumors of Gergiev taking over Moscow persist. When Gergiev was tasked with revamping a traditional Moscow event, the International Tchaikovsky Competition, he quickly took two of the competition’s divisions (violin and singing) to St.Petersburg, saying Moscow did not have the facilities to cope with such a big event. Muscovites grumbled that Gergiev was stealing their cultural heritage. Loomis remarked that the idea of Gergiev eventually having both theaters under his control “in a kind of reuniting of the old imperial theaters” is an issue that never seems to go away. It’s hard to speculate the about the future in Russia. 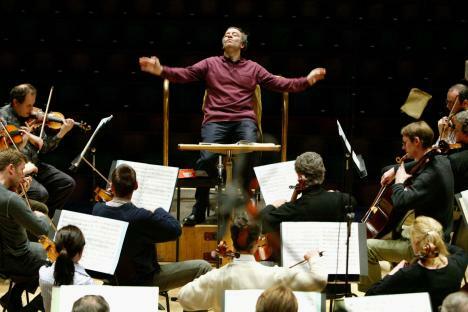 But one thing is certain – Gergiev is but one man, and a day has only 24 hours. The Gergiev people applaud everywhere is the Gergiev who aroused North America to a frenzy of admiration with his recent tour delivering unrivalled performances of Tchaikovsky, not the Gergiev that audiences in Russia occasionally groan about because he is half an hour late for his own performance, or because the orchestra is under-rehearsed. He may be called a superconductor, but he is not superman.